St Mary's Church is located at the junction with St Mary's Road and Fratton Road. St Mary's Church is the oldest church site on Portsmouth island and its history stretches back to the 11th century. The church has always played an important role in the life of the local communities. 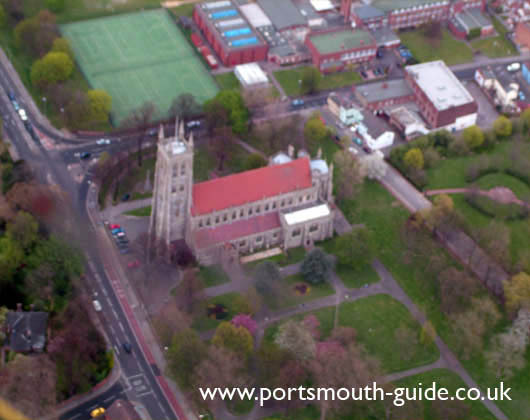 The current church, shown in the above picture, was built in the 1880's and can be seen from around the city and is a major landmark of Portsmouth. The church was built with the support of the First Sea Lord (WH Smith) and was built to serve the needs of Portsmouth and to be an inspiration to its people. The church is a grade 2 listed building and is surrounded by an extensive church yard. Within the grounds of St Mary's church and the church itself are many memorials and these include the Portsea Parishioners WW1 Cross, St Mary's Parishioners (Boer War) and memorials to many different ships. St Mary's was designed by Arthur Blomfield and is a fine example of a Victorian building. The current church contains one of the finest Walker Organs in England. Charles Dickens and Isambard Brunel were baptised in the previous church.